Chlorpyrifos is an organophosphate insecticide. It is no longer registered for use inside homes except as bait in containers, but it is still used in agriculture, on golf courses, and to control public health pests such as fire ants. Chlorpyrifos blocks an enzyme that stops nerve cells from firing without stopping. If the enzyme is blocked, the nerves don't send normal signals, and the nervous system fails. Chlorpyrifos is used in agriculture, but it is no longer registered for residential use. What are some products that contain chlorpyrifos? What are some signs and symptoms from a brief exposure to chlorpyrifos? 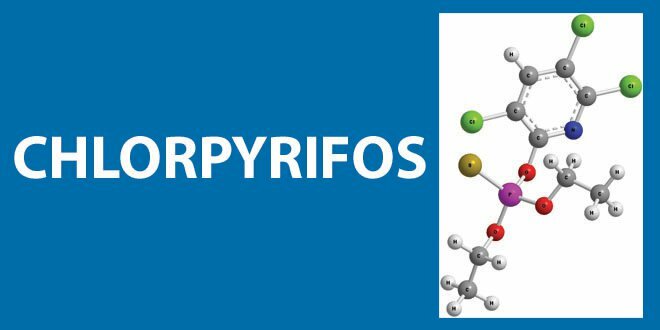 What happens to chlorpyrifos when it enter the body? Is chlorpyrifos likely to contribute to the development of cancer? Has anyone studied non-cancer effects from long-term exposure to chlorpyrifos? Are children more sensitive to chlorpyrifos than adults? What happens to chlorpyrifos in the environment? Can chlorpyrifos affect birds, fish, and other wildlife?